My overall best may come as a surprise, but I thought Sienna Miller really killed it. this dress is gorgeous on her, she looks young and fresh, and still looks cool while also looking like a total movie star. I worship her. Reese's look is certainly not ground breaking, but it is perfectly executed. Emma Stone kills a jumpsuit on the red carpet. Gywenth looks so great in pink and she was the only one that sported it. Naomi nailed it (except that belt). Seth Myers wife wears pleats perfectly. Kate Hudson straight up movie starred it up, she looks killer. Julianne Moore's metallic is so gorgeous as is her simple styling. Julia looks perfect. This other metallic dress on Dakota is amazing. Julianne Moore's dress is not that exciting, but the entire look just fits together flawlessly. These two ladies were looking good last night. Love that blue on Amy. Tina tried something original, which I love. Her hair, not so much. And can we all just bow down to these ladies? I am pretty sure they are either already or pushing 70. They are not my favorite dresses, but holy hell do they look amazing. Heidi is looking a little prom-ish as usual, but you cannot deny she looks great. I cannot decide if I love the leather belt on Kate Mara or not. But I think I do. 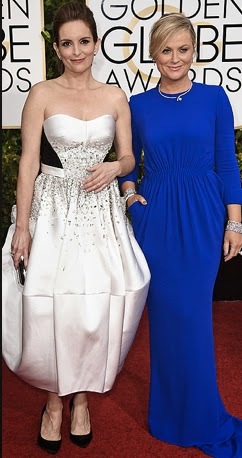 I sort of loathe Katherine Heigl, but she looks insane in this navy number. 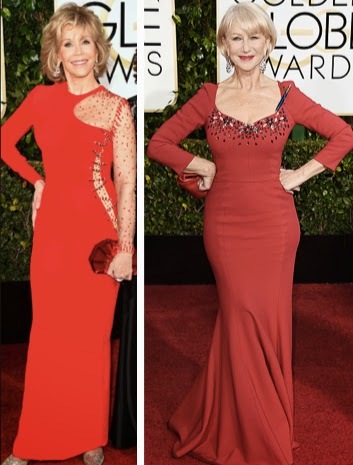 Diane's dress is pretty, but wish she would have turned it up more. Maggie looks surprisingly elegant. Love this dress on her. Emily's goddess dress is ok, her hair and make up is amazing though. Love me a throw back lame dress like this on Jessica. Chisty could have been on the best, but that strange crotch seam is throwing me off big time. Taylor looks a little severe with her hair and all the red, but still pretty. Leslie Mann can do no wrong in my book. Love that clutch, but not really with the yellow dress. Is Kate Beckinsale still an actress? What is she in? 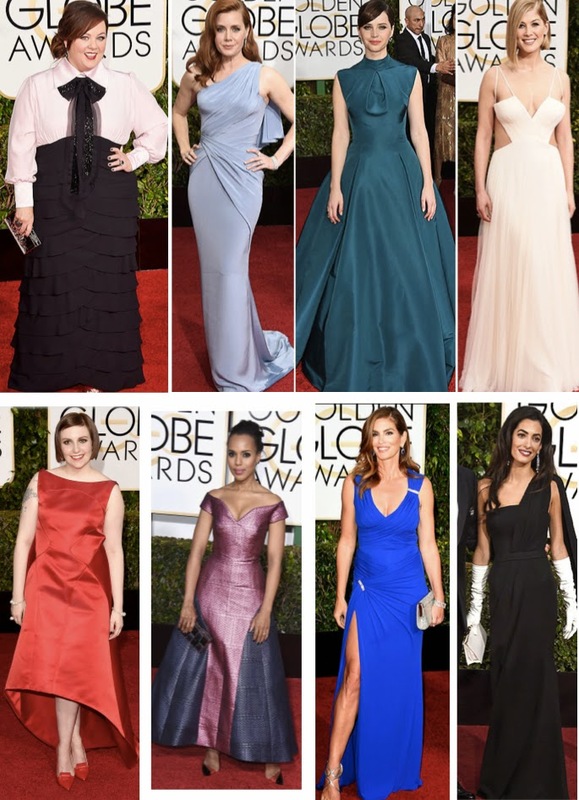 And why is she always at the Globes? Regardless she looks fantastic, minus the hair. Katie Holmes looks pretty, kind of boring though. Anna Kendrick is so hilarious and fun, this dress is very pretty, but she could have done better. Catherine's make up is not good, but this dress suits her I think. She might want to lay off the sugary too, she is looking a little frozen. Allison williams. I love you. But not in love with this, but you looks gorge. J Lo does the cape well, but the seams of this dress are strange to me. You cannot deny that she looks incredible though. This halter dress on Jennifer is eh. The hater is cheesy, the proportions are strange and she could do SO much better. Love this on Selma. Not a fan of the flower in her hair though. There were some risk takers last night that I loved. You may not agree, but I love me some high fashion on the red carpet to keep it interesting. These girls brought it and I love the results. There is a lot of volume in this group, which in the size 000 world of the red carpet is probably the riskiest move of them all. Kristen Wiig and Amanda Peets' dresses are so pretty and femme. Only the artsy girl from Girls can get away with this. I kind of love her in this entire look. Then that other girl from Girls, Zosia, looks great in this beige and pink. She usually goes a little far and this is so pretty on her. Claire went with some volume and pattern, besides that sheer in the middle (so over that look), I love this. And an expectant Keira is so pretty in this frock. Hate that butterfly hanging off her hand, but other than that I love this so much. Melissa McCarthy lost some weight and looks great. Why or why would someone put her in a half matador costume/Mother of the Bride dress? Her hair and make up look nice though. Amy Adams. What a snooze. This dress should be on some movie star's boring wife, not a freaking nominee! I want to love this teal number on Felicity, but I cannot get behind a mock turtleneck. Especially when it is attached to a giant dress. Too much fabric. Rosamund Pike just had a baby and looks amazing. This dress is strange and ill fitting, especially in the bust. Lena actually looks so great for her, again why is this tailored like this? Like it is supposed to be unflattering. Kerry's dress is horrible. Sorry, I said it. the metallic, the colors, the seam down the middle, the length, the shoes. Cindy freaking Crawford can do better than a dress borrowed from a RHONY housewife (original cast). Amal! God I love this lady. But the white gloves and white clutch killed this entire look. And after her insane wardrobe when she got married that bar has been set very high. What do you think? Who were your best and worst? I love to hear your thoughts!